If you have reached this tutorial, it probably means that you need to reset android on a Sony Xperia M device, to return it to it’s out of the box state, and with this get rid of errors or lock patterns, that prevent a good use of the device. We will teach you two very easy ways to reset Android on Sony Xperia M.
If you have total access to the Applications Menu, then it will be easier to use the first method which involves a soft reset of android. If you don’t have access to your phone, maybe because you forgot the lock pattern, you will need to use the second method, which involves doing a hard reset of Android on the Sony Xperia M. Both methods will result in your Sony Xperia M being in it’s out of the box state, returning to it’s factory settings. It’s very important that you check that the battery of your device is charged at at least 80% capacity to avoid any surprise shut-downs. 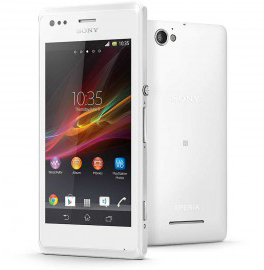 Go to the Applications Menu of your Sony Xperia M device. If you wish to delete all the information on your phone click on Erase all data. IF you’re going to do this, make a backup of your data just in case. The process will start automatically, and once your Sony Xperia M restarts, it’ll have gone back to its factory settings. If you have lost access to your Sony Xperia M, this is the method you will use to reset android, and return it to factory settings. Make sure your Sony Xperia M is turned off. You can do this by removing the battery, wait a few seconds, and then reinsert the battery. Press both the volume up and the power button at the same time, for about 10 seconds. A screen will appear with a menu, select the Factory Reset option, using the volume buttons to navigate through the options and the power button to select. Follow the instructions on the screen and once you’re done, the Sony Xperia M will reset itself and return restored to it’s out of the box state. If you have followed the instructions for any of the two methods correctly, you should now have reset android on the Sony Xperia M, thus returning it to it’s factory settings.